In recent weeks, football has been rocked to its very foundations, and at long last there are whispers of change. 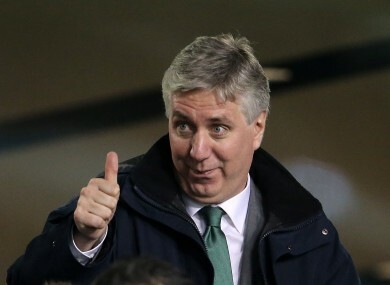 In Ireland, FAI CEO John Delaney, who earns over €300,000 a year, revealed a secret payment of €5 million from an institutionally corrupt organisation (FIFA) that was kept secret from FAI members and the paying public. That €5 million was the price of Ireland’s silence for an erroneous refereeing decision. Unfortunately, there are more sinister goings-on at the FAI than a simple €5 million backhander, and pretty much all of them have to do with protecting its most powerful man. Over the weekend came the revelation that a match program for the Scotland game was printed, and then pulped, and a new one produced, with references to transparency and accountability removed. The remarks were contained in Delaney’s address to the Irish football family in the program. That statement is not even remotely credible. Any communications executive – in this case former Ryanair spokesman Peter Sherrard, who was thrown under the bus in a statement released by the association – changing the words of the CEO in a document for public circulation, about a topic of global public interest, and without that CEO’s consent, can expect to be sacked on the spot. Unawareness, it seems, can be used to explain away a myriad of inconsistencies. When a video clip of him singing a Republican song was circulated online last year, Delaney’s solicitors – the favourite tool of the powerful (such as Delaney’s good friend Denis O’Brien) when it comes to steering the discourse about matters of public interest – contacted media outlets, saying that they would simply deny that it was their client in the video. But Delaney was, of course, “unaware” of the legal threats, as he was on an aeroplane at the time. But despite his being indisposed on a plane, it seems taking to the air is not for everyone. On Saturday, fans had gathered money together to organise a fly-over of Landsdowne Road by a light plane pulling a “Delaney Out!” banner. In an even more sinister development, Gardaí – who have no jurisdiction in such matters – visited the Weston Airport where the plane was based in an “advisory” capacity, and reportedly cited health and safety concerns. The plane never took off. For the last two home games, fans – in particular those headed for the “singing section” at Landsdowne Road which provides much, if not all, of the atmosphere at Ireland games – have been searched on the way into the ground. Banners and flags – especially those critical of the FAI or with “Delaney Out!” messages printed on them – have been confiscated. On occasion, the reason being given was that the banners and flags weren’t “registered”, whatever that is supposed to mean. The fans have, according to themselves, been surrounded in an intimidating fashion by security personnel during the games against England and Scotland. The official FAI Twitter account has so far refused to engage with me on the issue – not uncommon when one’s media policy is basically the North Korean playbook. The FAI simply see no reason to honestly answer valid questions put to them. Delaney is and has been enormously critical of Blatter, and especially of the geriatric Swiss administrator’s clinging to power when many want to see a new broom. But instead of engaging with those who are critical of his failings – the free-fall of Irish football, its perilous financial state, and his own drunken ramblings around Europe while ostensibly representing the game in Ireland – Delaney seeks to silence them, in much the same way as Blatter seeks to shunt the elephants in the room behind the curtains. Like Blatter, John Delaney should step aside, because like Blatter, more time is currently spent discussing John Delaney than the issues that face the organisation he is supposed to be running. Both the FAI and Delaney seem to spend most of their time explaining things they have done, or ignoring things they should be explaining. But like Blatter, John Delaney will not go voluntarily, or quietly. Whether it is ego or greed that drives them, the rich and powerful, and their attendant sense of enormous entitlement, are not prone to bouts of soul-searching or self-awareness. And despite the enormous preponderance of evidence to the contrary (his annual salary is three times more than the prize money the League of Ireland winners get), Delaney genuinely believes that he is doing a superb job administering football in Ireland. For that professional hubris alone, he should resign. Because if, like Blatter, he were to listen to the valid criticisms of the fans, he would see the enormous damage he has done to the game he claims to love, and quickly call full time on a reign of obfuscation, dubious finances and sporting failure.